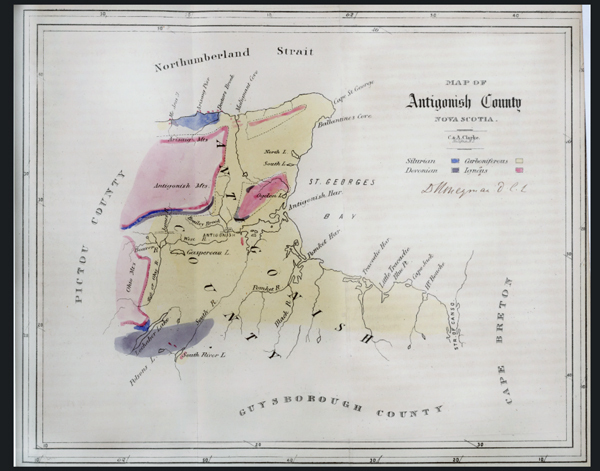 In 1867, a year before the Provincial Museum was formed, David Honeyman published the paper "The Geology of Antigonish County". This paper included a hand-coloured geology map that showed the geological features of the region. Imagine the excitement! Publishing a colour map would have been rare at the time, considered 'high-tech' even. In order to reflect on the significance of this map we can consider what it meant for Honeyman and the international community. Imagine living in 1867, travelling through rural Nova Scotia on horseback or carriage, examining the landscape and collecting rocks. Houses are heated with wood stove and coal, but kerosene invented recently provided excellent light to read and write at night. There is no GPS, and no images of the landscape from planes or satellites. Maps were innovations created by carefully surveying and measuring the landscape from the ground. Honeyman carefully studied the landscape of Antigonish, living in the area for over 15 years. He published his first paper on the Fossiliferous Rocks of Arisaig (1859), only four years after reading J.W. Dawson's first edition of Acadian Geology (1855) and becoming interested in Nova Scotia geology. His maps and fossil specimens were displayed at the International Expositions (1862 and 1867). We will examine some of these fossils in future posts. For now, as we begin our journey of #FindingHoneyman his map provides a key to unlock the secrets of his studies and discoveries. Honeyman's map shows us how far we've come and how different we visualize the landscape. In our digital era, it's now so easy to explore features of the landscape viewed from high above, our smart phones showing us the latest satelite views. To study the landscape like Honeyman did, we need to walk along the shores and rivers, carefully examining the rocks and fossils. We need to smell the trees, and feel the cool wind on our face. Imagine his horse, burdened by a pack filled with rock samples, taking David Honeyman home where he will sketch out his discoveries under the flickering light of kerosene. Look how far we've come in just 150 years.